Meeting agendas and informational packets from the most recent meetings are posted on this page. 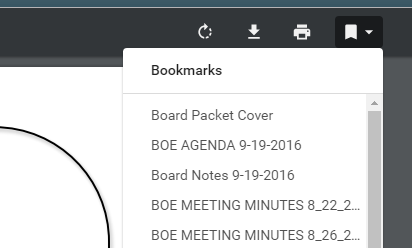 Older packets can be found on the Archived BOE Meeting Packets page. This is a large packet so some items are uploaded individually. If viewing with Adobe Reader, use the ribbon icon on the left side of the screen to show bookmarks (section headings) for content sections. If viewing the document in Chrome, hover your mouse at the top of the document, then click on the bookmarks ribbon at the top right corner to view thumbnails.